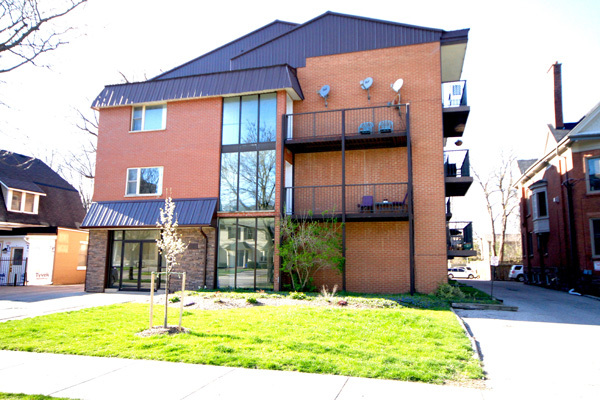 This 24 unit apartment building is located 1 ½ blocks east of City Hall on a mature Street scape. There is a mix of Victorian single family, multi-residential and office buildings. If you are looking for the feel and vibe of living in the Centre of the City at an affordable price this building is for you. It’s a quick walk to the City Centre office buildings and entertainment and restaurants of Richmond Row. If you enjoy biking the City bike paths are easily accessed and a City bus stop is in front of the building. Parking is also offered in the rear of the building, at a small fee per spot. It is a controlled entry building has internal laundry and bike storage room. It’s large apartments have been recently upgraded with new kitchens, ceramic tile and hardwood laminate floors and most utilities are included.